Linda Walsh Ryan, Jane Abling and Sheila Jarasek in Over Here! They're jumping, stomping and jitterbugging to beat the band in the current Kirkwood Theatre Guild production of Over Here! Best of all, there actually is a band -- a 13-piece band, live onstage. The playbill labels it an orchestra, but it sounded like a band to me, bursting with brass à la Harry James and drums by way of Gene Krupa. Although this merry band spends the evening wailing out a string of World War II-era pop tunes that you'd swear were penned by Johnny Mercer and Hoagy Carmichael, in fact the entire score for this 1974 musical was written by Richard and Robert Sherman. In this, their only Broadway outing, the brothers Sherman (best known as the composers for such Disney films as The Jungle Book and Mary Poppins) succeeded uncannily -- sometimes to the verge of theft -- in evoking the 1940s big-band sound. There's not a tune in Over Here! you've ever heard before, but you'll think you know them all. The show's plot is so simplistic it might have been written on the back of a Bazooka bubblegum wrapper. Except for one brief musical interlude about 1940s racial prejudice (movingly performed by Chris White), nothing is to be taken very seriously in this chronicle about a cross-country train trip on which two female band singers are looking for a third voice to fill out their trio, a hapless German spy is snooping for secrets and a hormone-happy GI is trying to score with his girl. Although the show is a harmless paean to patriotism (I was especially charmed by the youthful red-white-and-blue-spangled baton twirler), director/choreographer Janet Ehrlich has wisely avoided the pitfall of trying to lard her production with post-September 11 "significance." She's much savvier to keep it moving, keep it frenetic and -- like a real runaway train -- allow the sheer momentum to drive the action forward. Over Here! 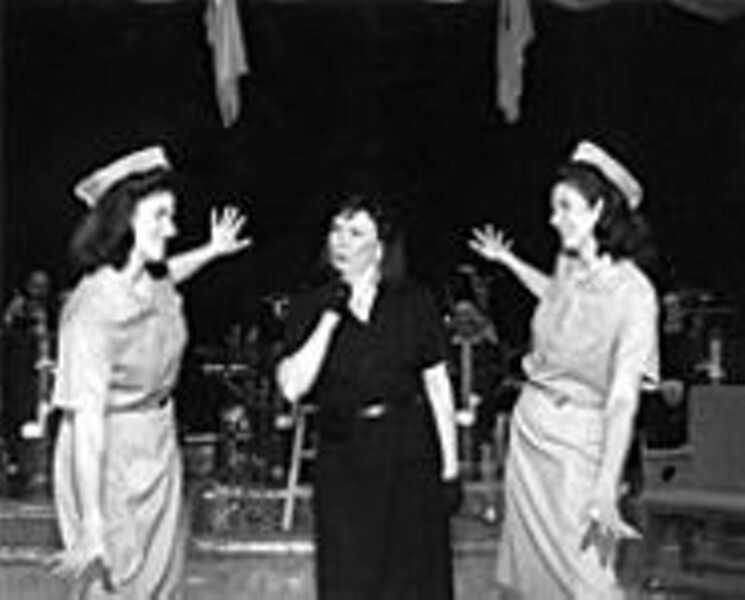 is no longer dependent on the presence of the Andrews Sisters. But as this exuberant amateur-theater production proclaims, it's still serendipitous to cast siblings in the two leads. Real-life sisters Linda Walsh Ryan and Sheila Jarasek seem to be having a ball performing together, yet they don't allow the family reunion to intrude on their chief responsibility, which is to dominate the proceedings. Ryan, in particular, is a knockout talent. Anyone looking for a rousing evening of mindless good fun should look into this big-band musical. But don't tarry too long. I have a gut feeling that -- word of mouth being what it is -- by next weekend Over Here! will be the scarcest ticket in town.